Eco and health friendly wool carpet just came along with an amazing and electric new twist – embedded LED lights. The cool new carpeting from Dutch design studio, Lama Concept, comes in a whole slew of wonderful and bright colors, plus they can be tailored to fit your exact need, mood or interior. 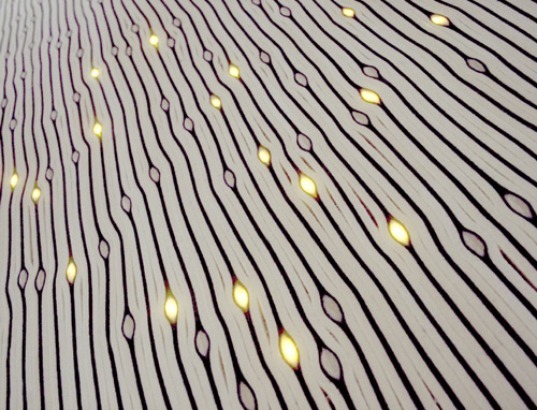 Lama Concept has a few different lines of wool carpets, but their Cell line is the really impressive one – especially since it comes with the embedded LEDs. The carpets and rugs are made from 100% wool felt strips that are formed around eye-like forms, like knots in wood. Some of these knots are replaced with LED lights and oriented with the direction of the strips. The carpets can be created to form a directional path with the LEDs, or the lights can just be placed randomly for a glittering array. Colors of the wool strips, arrangement of the lights and the amount can all be customized. Dutch designers Yvonne Laurysen and Erik Mantel head up Lama Concept, which also creates other interior designs, like lamps, storage and decor. The Cell carpeting is definitely a hot ticket item, and companies like Airbus and Land Rover have made use of the high tech carpeting. And not only does it use energy efficient lighting and eco friendly materials, but if a part of the carpeting wears out, you can easily replace just that. Eric I don't think I would want think it my home but it would be great in a hip restaurant or movie theater. How many years should the carpet last for? These would make for such a cool like display. I'm not sure I'd want this carpet in my home, but it would certainly be attention grabbing in a store. 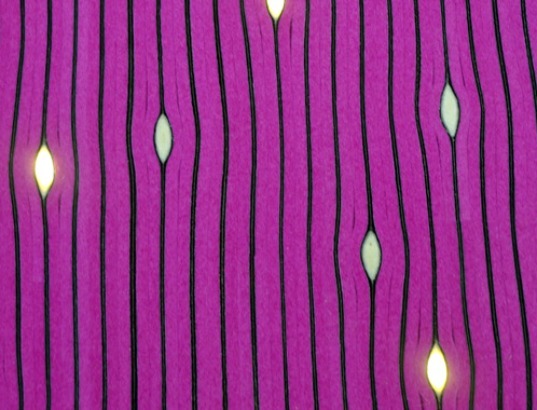 Eco and health friendly wool carpet just came along with an amazing and electric new twist - embedded LED lights. The cool new carpeting from Dutch design studio, Lama Concept, comes in a whole slew of wonderful and bright colors, plus they can be tailored to fit your exact need, mood or interior.